Chess, along with Go, must surely be two of the most venerated games in the history of humankind. There aren't many other games out there that still have competitive scenes 1,300 odd years after being invented. League of Legends certainly won't. The reason for these games enduring popularity is the depth of them, and the sheer intellect that the games require to find the true masters. There are millions of different ways a chess game can play out, despite being played on an 8 x 8 grid, making it incredibly easy to learn, but taking a lifetime to truly master. 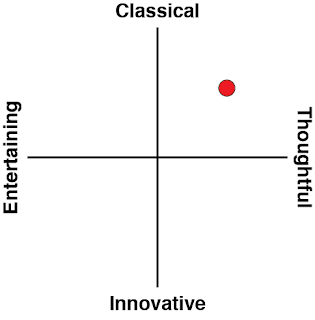 Related reading: Matt's review of Chess Ultra on the PlayStation 4. The challenge in bringing chess to video games is in the AI. If you can’t offer players a convincing, human-like challenge, with both moments of brilliance and elementary mistakes, and one that scales in kind as the player themselves improves in ability, then it doesn’t matter how much effort you put into the presentation, your game will ultimately fail. Pure Chess, which was developed by VooFoo and published by Ripstone, and now Chess Ultra, developed by Ripstone itself, absolutely understand the beauty of a good chess board. That much is obvious from the screenshots. Thankfully, the AI’s up there too. 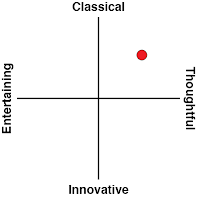 I’ve already reviewed Chess Ultra on the PlayStation 4. From the comprehensive tournament and multiplayer options, through to a neat PlayStation VR mode (play against the grim reaper! ), and the single player AI itself, it is a cracking game. The Switch version, by virtue of its portable qualities, is even better. The game looks lovely on the Switch’s screen when you take it out and about. 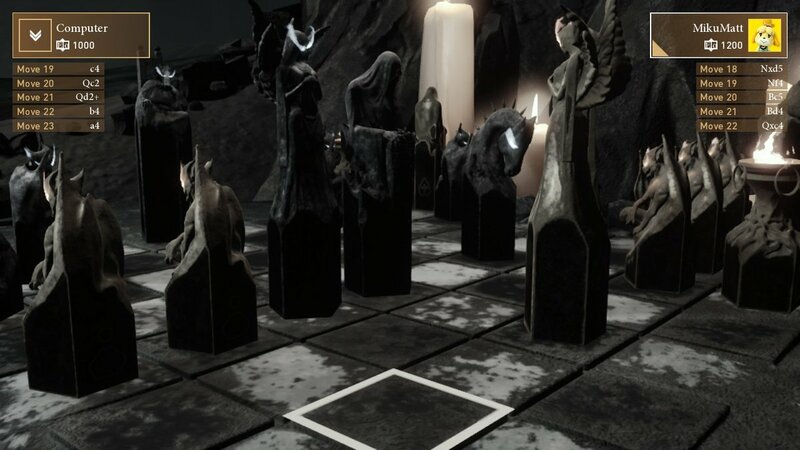 The fetishistic level of detail implement into each chess piece, as well as the environments that serve as some classic backdrops to play in are simply so elegant and appealing they would scream "pure class," if screaming were a classy thing to do. Or in other words, I’ve never played chess in a museum, but boy would I love the opportunity to do so - it's the prefect location for it, and Chess Ultra provides that ambiance perfectly. When playing out and about there is a drop in resolution fidelity, of course, but that's not nearly enough to dampen the impression that this a visually vibrant and interesting game. There are a number of different types chess pieces to choose between to play, too. As I noted in my review of the PS4 version of Chess Ultra, it’s a bit disappointing that this game doesn’t have the gorgeous novelty sets that Pure Chess had back on the PlayStation 3/ iPad (and other platforms). I love collecting chess sets in real life, and appreciated that element to Pure Chess. In Chess Ultra we instead have a handful of the most popular “official” chess set designs that you buy in stock standard real-world chess sets, and one novelty, Gehenna-themed set, which depicts a battle between two armies of devils. Unfortunately while that set looks the part, it can be difficult to differentiate the pieces when it comes time to play the game itself. So, yes, the range of chess pieces on offer in Chess Ultra is disappointing. It's superficial, but disappointing. Mostly I just miss my forest animals set from Pure Chess. Putting aside the superficial though, Chess Ultra plays beautifully. For when you’re at home and want to play online, there’s cross platform play between the Switch game and the PC and Xbox One versions (sadly, not PlayStation 4). For when you’re out and about and want to get a quick game in with a friend while on a lunch break or in a coffee house, you can place the Switch screen down as a board and give both players a Joycon for a very authentic board game experience. And then if you’d like to play in single player, there’s a very high quality AI there to challenge you. From novice through to “grand master” the game does a really good job of not only being “easier” or “harder” based on the difficulty setting, but also reflecting the more complex strategies that get played by the more experienced players. 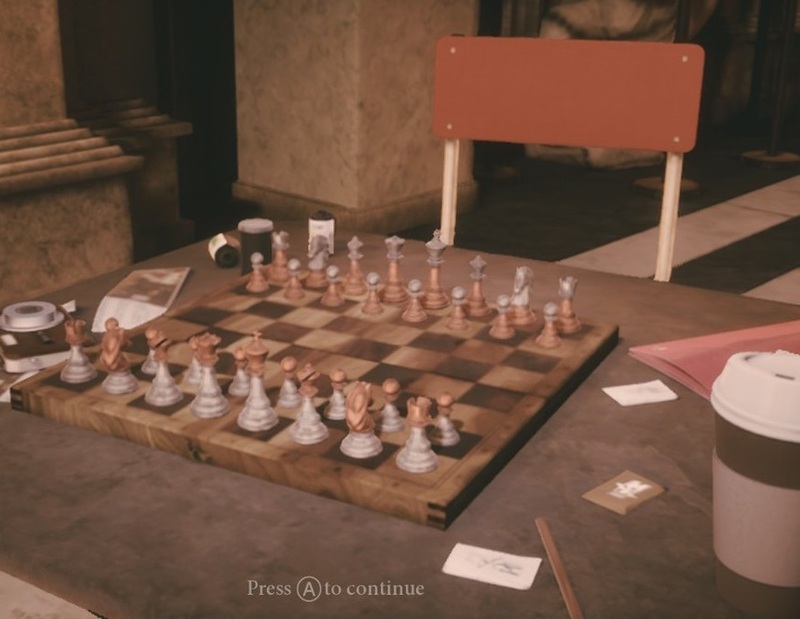 The developers of the game are clearly students of chess itself, because the AI doesn’t just move pieces around – it actively throws the textbook at players as they escalate the difficulty level. In addition to simply being able to play against someone, Chess Ultra offers detailed custom tournament options, so if you can get a couple of people together, you can really figure out who among you is the chess master. Thankfully, you don’t need to all be online at the same time, as Chess Ultra offers a “play by mail” system; you’ll take a turn, and then the other player has a certain time to jump in and take their turn. If you’re both online at once then these turns play out in real time, of course, but it’s a huge bonus to be able play someone on the other side of the world and take your turn when they’re asleep. Yes, it can result in long, drawn out matches, but chess is a game of patience, right? You’re also able to have quite a few games going at once, so if you get them all going at once you’ll be spending a lot of time in the game each day anyway. 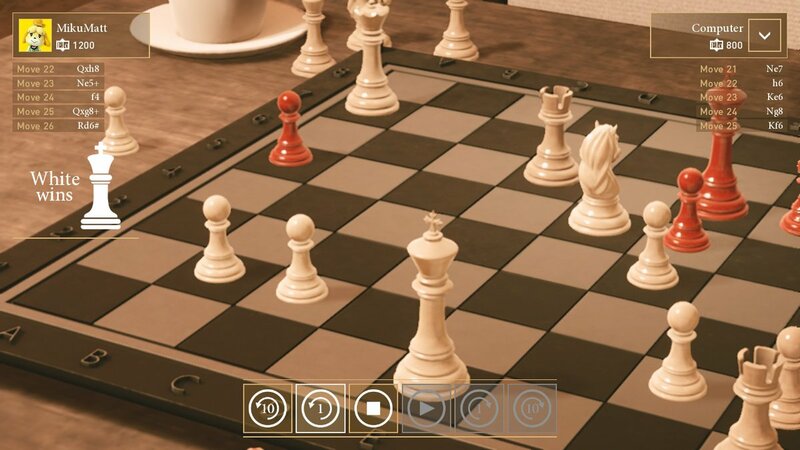 Obviously the Switch loses the neat, but ultimately gimmicky PlayStation VR mode with Chess Ultra. What it replaces it with is a far superior featureset, though; cross platform play with anything but Sony’s console, as well as that really neat local multiplayer mode that turns the Switch into an impromptu board. That is so much more convenient than lugging a chess board down to your local café, park, or pub for a lazy afternoon of chess with friends.